Amanda Goss. Denton, TX, Independent School District, first posted this at http://agoss.edublogs.org/2015/11/18/adaptive-action-ncte-2015/. At once both terrifying and rewarding, conferences with students have become the single most important tool in my teacher toolbox. As I’ve transitioned out of my own classroom and into an instructional support role, I’m eager to share what I’ve learned about conferences with the teachers, counselors, and administrators I now collaborate with on a daily basis. As the Response-to-Intervention (RtI) Coordinator on a high school campus of about 2,500 students, I have the opportunity to work with teachers across content areas to facilitate additional support and intervention opportunities for students. Each day looks different, but I still love the days when I have the chance to work with students in small groups or one-on-one. Literary Genres, a redesigned elective course we are providing to juniors who have not yet been successful on the English I or English II standardized test in Texas, has allowed me many opportunities to work with students this semester. My colleague teaching the class is an expert at building relationships with students, and I am often amazed at the stories students share with her as well as the empathy and compassion in her responses. So when she expressed apprehension at the mention of doing writing conferences, I was shocked. (And also a little bit glad that I am not the only one who finds reading and writing conferences to be somewhat daunting.) We didn’t have much time before the students would arrive, so I suggested that we use the three questions of Adaptive Action to facilitate our conferences and keep our conference records in Google Docs unified. Twenty minutes later, sitting at a desk with a junior and his completed essay, all I can think is “What in the world am I going to say to this writer?” I knew he needed to revise the draft, but I had no idea what I was going to say to motivate him. If I gave him a suggestion, I was fearful that all he would hear is disapproval and a reason to give up on the piece of writing. Luckily, the three simple questions I had just shared with his teacher were fresh on my mind. I asked the student to read each sentence of his essay and identify whether the sentence was mostly concrete or abstract, two words we had a shared understanding of because of previous lessons in class. I was asking him to answer the first question that guides all my writing conferences: What do I notice? Upon reviewing the essay and identifying his sentences, he said “so I need to add concrete examples?” He was answering question number two: So what differences would make a difference? I was able to utilize something I had read in his writer’s notebook to make a suggestion in regards to the third question: Now what next step can this writer take? He had used a military slogan in a quickwrite, so I asked him if he felt he could use what he knew about the military as a concrete example to support his thesis. Having discovered what was needed in the draft on his own, he started revising his essay, and I began to document what we had just discussed in Google Docs. By utilizing shared Google Docs, the teacher of the class and I can both record our dialogue with students and reference it as we have additional conferences. Each student has their own document, and each entry is simply the date and the three questions: what? so what? now what? Using these three questions to structure writing conferences helps us feel more comfortable and brings coherence to our record keeping. We also use this document to record information about the student’s independent reading. What is the student currently reading? So What would it take for this student to improve as a reader? Now what is the student willing to try / what is their next goal as a reader? Just a few weeks later these same three questions became the basis of a tool I created to share with our counselors and administrators. One of our goals with RtI on our campus is to increase communication with teachers and parents. Meeting one-on-one with students is a daily occurrence for our counselors and administrators, but I wanted to help them see that the impact of these conferences could be magnified by sharing pertinent information with teachers and parents. When all parties know the action steps, they can help hold students accountable and encourage them in building different academic habits. My associate principal agreed that we need to focus on improving communication and asked me to create a form letter that could be used to email teachers and parents. 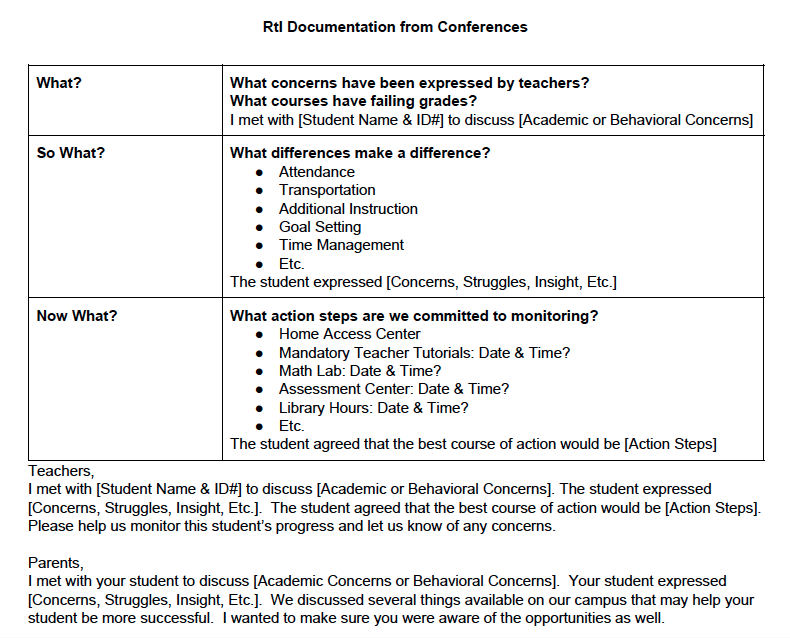 I wanted our counselors and administrators to see my thought process instead of just a form letter, so I used the three questions to create a tool for RtI Tier 1 Conference Documentation. I wanted to help facilitate conversations that would allow students to express their concerns and struggles, examine the patterns in their academic progress and behavior, and be a part of the decision making process that might lead to more academic success. As I was creating this tool, I felt I was stating the obvious; I was just thinking about how I conduct reading and writing conferences. Time revealed that we didn’t all have shared understandings about how we approach student conferences. The tool eventually opened up dialogue between counselors and administrators and set up expectations for how we approach student conferences and communication with our teachers and parents. I hope it is helping set the conditions for the kind of student conferences that have the potential to truly improve academic progress. As we have discussed using this new tool at subsequent RtI Meetings, several individuals have expressed positive feedback from parents and teachers. Our Special Education Coordinator shared this tool with the case managers for our SPED students, and they are now using it at the end of each marking period to communicate academic progress with parents. An added benefit I see is that as our counselors and administrators utilize this tool in their communication with teachers, it provides a model for how teachers can communicate with students and parents. Schools, classrooms, and even conversations with students can be seen as complex systems. Although there are patterns, they are full of dynamical change and thus unpredictable. However, we know that shared tools can place a constraint on the system that allows all parties to work together more efficiently and ultimately make better decisions in the midst of uncertainty.